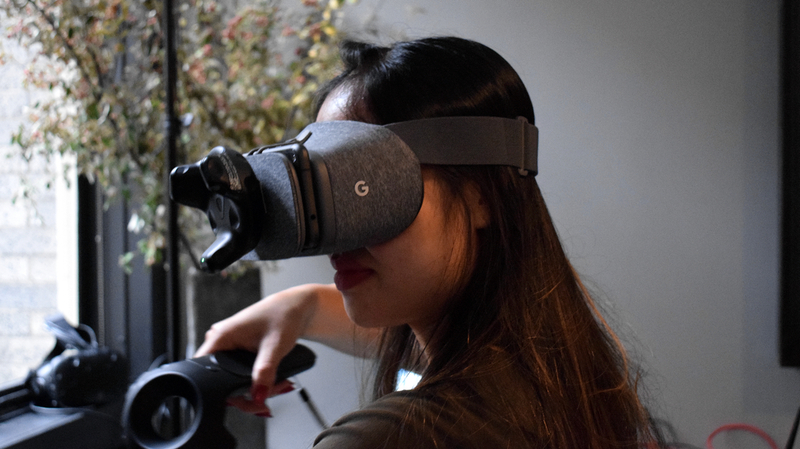 There are more ways than ever to bring virtual reality into your home, but when it comes to the Really Good Stuff, price remains the biggest impediment. At an Intel event this week, the company showed me an intriguing proof of concept the company has been working on, demonstrating one way the barrier of entry might one day be lowered. The headset was a Google Daydream with a Pixel smartphone inside and one of HTC's Vive Trackers stuck to the front. The game, however, was being beamed from a desktop PC nearby, and I was totally tether-free. I was handed two Vive wand controllers and thrown into Valve's The Lab, a title I'd only ever played on a run-of-the-mill HTC Vive. So what the hell was going on? All the legwork was being done by a PC and being streamed to the smartphone's Wi-Fi, while the Vive Lighthouse base stations around the room tracked the puck on the headset and controllers in my hands, as they would if I were wearing a Vive. It sounds a little chaotic, I know, but the result was quite something. When I put on the headset it was immediately clear that the quality wasn't up to the same level it had been when I'd previously played it on Vive. The image had been optimized, but there was noticeable latency. Not enough to make me feel nauseous, but it wasn't quite up to scratch. Yet it was still good enough to get my mind racing around the possibilities of what this could do for high-end VR. Kim Pallister, director of Intel's virtual reality center of excellence, explained that the workload was being shared between the PC and the smartphone, with the phone performing tasks like timewarp (a technique that transforms images based on head movements to reduce latency). That allowed it to stream the PC content wirelessly without any significant drops in quality. Intel has no definite plan here, but as a concept it shows how the cost of VR could feasibly be reduced by allowing people to use their existing smartphone for PC VR, rather than buying a headset like the Oculus Rift or HTC Vive. They could just buy some cheap controllers and base stations, and they're VR-ready, no expensive headset required. It's no certainty that every super high-end game would perform as well as The Lab when streamed to a phone like this, but then as smartphones improve, so too will their ability to take over some of the work. It's all just a concept project for now, but Intel's giving us hope that better VR could also soon be more affordable VR.